Building The Sale is a step by step process of planning and conducting a sales presentation that will maximize your chances of being successful. It will allow you to plan the most efficient route to follow from the point of beginning which is, “Hello, welcome to Oak Bridge”, to the point of destination, which is, “Congratulations! I know you are going to be happy living in your new home." The process is depicted as a home resting on a home site. Here it is for your enjoyment. There are several messages embedded in this image. The best way to build a sale is the same way you would build a home. You start at the bottom and you work your way up. It would be as silly to attempt a Close before completing the steps below as it would be to hang a roof in mid-air. No surprise, closing is important. It roofs the home, and it caps your sale. Closing is what everyone expects you to do. Closing well is your obligation to your builder. The entire company is dependent upon closings taking place. Because it is so important, closing is the most likely sticking point in the minds of salespersons about the selling process. Building The Sale is intended to make closing easy and obvious. There is, in fact, a simple test to use when deciding whether or not the time has come to ask for the order. Once you have completed the underlying steps in the process, simply look at your prospects. If you can see their faces, it’s time to close. If you discover you’re alone, it’s probably not time to close. It is a happy coincidence that follow-up is shaped like an arrow, pointing the way upward toward your personal success in new home sales. If you will only do your follow-up, it will be impossible not to succeed. Follow-up’s position as the third dimension, adding depth to the diagram, is intended to show that no matter how much of the sale you get built today, it will begin to fall over unless you hold it up with follow-up. No one seriously questions the value of follow-up. How is it, then, that almost nobody does it? Let’s take a quick look at each of the steps involved in making a world class new home sales presentation, shall we? Following this proven method entails learning how to Welcome your customers correctly, gaining the information you want from them and beginning the process of establishing control over the sales presentation to follow. The welcoming process is also your one opportunity to make a good first impression, which is vital to the process of building rapport. Next, you must Evaluate your customers to determine their requirements, their urgency, their experience, their situation, their ability to buy and their personalities. How can you possibly know how to help your customers until you know why they are there? And yet, unknowledgeable sales people rush into explaining their products without evaluating their customers every day. When you show a sincere, yet professional interest in your customers, you will be building real rapport with them. To the extent that you succeed in building rapport, they will begin to relax. They will start to like you as a person and respect you as a source of accurate information and good advice. Isn't that what you want as a sales professional? When you are satisfied that you understand what your customer may be looking for, it's time to Demonstrate your product. Your goal is to build your customer's perception of value in your product so that the price appears to be reasonable in comparison. The process followed is to ensure that the customer recognizes the value of everything in the product that costs the builder money to provide. This starts with an explanation of the desirable features and benefits of the surrounding area. Then, the presentation concentrates inward to the community itself. Finally, the features and benefits of the dwellings themselves are presented in a manner designed to achieve maximum impact. Almost inevitably, the process of demonstration will be interrupted from time to time by customer questions or objections. Being able to answer these questions and Resolve the objections without losing momentum is the hallmark of true sales professionalism. When your customers begin to identify with your location, community and product, it's time to Select the one home that's perfect for them. This involves choosing the best design plan in the particular location they prefer. The idea is to create the feeling that there is one property only which best satisfies their needs and desires. Uniqueness fosters urgency; the fear of loss is the greatest aid to wrapping up the sale that there is. This is the most important activity of all. Quite literally, if you cannot close, you cannot sell. Even so, all of us sometimes avoid trying to close because we instinctively fear rejection. Following this planned presentation sequence will eliminate that fear by making sure that you have presented to the customer all of the information a reasonable person would require prior to making a decision to purchase a new home. If your customer is still with you when you reach the point of closing, permission has been granted for you to ask for the sale. Since so few customers realistically can be expected to make a binding decision to purchase on their first visit, a productive sales system must include a detailed and effective program of customer Follow-Up. The object is to maintain positive contact with your customers so that you can attract them to come back for another visit. Here is where the rapport you were able to create during the first visit will show its importance. No matter how skillful you become at conducting your customers through Building The Sale, it will quickly become apparent that your selling process is dependent upon three critical support functions for its success. Outreach represents all the promotional activities home builders have traditionally used to attract prospects to their sales facilities. Newspaper advertising, magazines, billboards, temporary roadside signs, direct mail and sometimes radio or television have been mainstays of outreach for years. Until recently, these media have produced close to 100 percent of site-visiting prospect traffic. They will continue to be critical in years to come, but now there is a new star in traffic production. The Internet has become dominant as the medium of choice for buyers looking for new homes. In our diagram, we are attempting to indicate that roughly half of your site-visiting traffic will have viewed your web site before actually crossing your threshold. That means that half of the people you welcome to your sales facility are actually return visitors of sorts. The Internet is further distinguished as a promotional medium because it can actually engage web site viewers in the selling process itself, conveying them upward through the steps, including even closing. As time passes, this aspect of Internet exposure, actually completing the selling process remotely, will become more prevalent. For now, it is simply critical that you have an Internet presence, that you employ social media techniques to build relationships to support your web site, that your web site looks good, that it imparts information seductively, that it functions well, that it can be readily found by interested buyers and that it produces leads you commit to engage. No selling process can continue to deliver closings if your company’s delivery process is flawed. It is absolutely critical that any kinks in delivery be identified and resolved. Production persons and sales persons frequently have issues about processes and customers. There is often a difference between what customers feel they can expect and what the company feels is good quality and caring service. Ours is the last industry to get the message: The customer rules. Wouldn’t it be grand to have your company’s production leaders learn about this selling process? They would get the picture that what salespersons do is not necessarily easy. That would help in team building, wouldn’t it? Maybe it would be fun to invite your production guys to spend a Saturday afternoon in your sales center . . . alone. But, you should make a corresponding commitment: to spend a day in the field, learning about the challenges they face. The result would be a beginning of reconciliation to whatever degree it may be needed in your company. 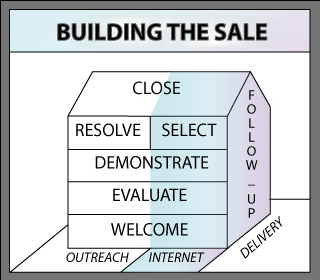 The little house diagram illustrates the sequence of delivering a new home sales presentation – the process, if you will. In each step, there are objectives to be accomplished and specific techniques to help salespersons get them done. But, that’s only half the story. The complete training curriculum includes powerful human communication material that will help salespersons understand their customers better so they can be almost unbelievably persuasive without applying pressure at all. The difference between salespersons of average competence and the superstars of new home sales is their level of understanding of human behavior, motivation and communications. Several bodies of research have been developed on these subjects which offer tremendous benefits to the new home salespersons who aspire to reach the top. The Social Style Grid is an observable behavior observation and classification system that offers powerful insights into how to tailor sales presentations to conform to customers’ preferred way of thinking and communicating. The result from doing this right is that customers will feel more comfortable during the sales encounter and will naturally come to like and respect the salesperson. Think of this as rapport-building on steroids. All of us have a natural Social Style defined by our personal mix of assertiveness and responsiveness. All of us fall into one of four primary social styles. We instinctively like people who share our social style and have some degree of difficulty relating to people whose style is different. Salespersons un-trained in the Social Style Grid make presentations in their natural style. They do well with 25 percent of customers they meet. When they encounter a customer whose social style is different, they sense a disconnect. The most common reaction to this is that the salesperson turns up the heat on their natural style. This only makes things worse. After mastering the Social Style Grid, salespersons will come to work prepared to deliver four different presentations of the same product, all leading to the same concusion - a buying decision – but differing hugely in content and pace. They will be able to evaluate the social style of customers quickly and choose the best presentation to give. The result will be an increase in their sales conversion ratio, bringing higher compensation to them and producing more revenue for their company. Understanding the innermost dreams and aspirations of customers is an even more powerful new home sales tool, because motivations more than behaviors govern customer buying decisions. This body of knowledge was first developed by the Stanford Research Institute and has become the gold standard of consumer products marketing. In this way of thinking about consumers, all of us fall into one of eight categories based on our inner value system and our degree of freedom to express our values in our product purchases. VALS is the root of my belief that it is much more important to consumers what ownership of a product means to them than what the product does for them, unless the product is something trivial like toothpaste. Trust me, the Emotional Value of a new home is much more powerful than its Utility Value in triggering a buying decision. Since there are eight target market segments, each with its own set of value triggers, it is critical for new home salespersons to be able to classify their customers quickly and portray the homes they want to sell as satisfying emotional need their customers certainly have but are probably not aware of. Negotiating to win is a skill set that can be taught. The model comes from the bull pit of negotiating – manufacturer’s rep vs. purchasing agent, where both need to win, but only one can. In new home sales, the negotiating environment is generally much kinder, but not always. In times of market stress, new home prices become prime targets for assault, especially when customers are accompanied by buyer’s agents. In a flat-out negotiation, the party who can muster the most power always wins. Understanding where power can be found and how to use it effectively is the learning objective in this module of my training. New home salespersons who master this body of knowledge will understand that contrary to what they may have thought, they are in a commanding position. Of nine classic power sources, they control seven going in. Capturing the other two always results in a sale. Always. Knowing that, they can go after the other two with purpose and confidence. This is the professional study of Body Language. It is a scientific fact that 87 percent of the meaning in human communication is conveyed by gestures, postures, movements and facial expressions. Understanding how these work to reveal customers’ true feelings is a critical skill for new home salespersons to have. The bottom line is that many people can lie convincingly with their spoken words, but only professional actors can lie with their bodies – and then only with time to rehearse. Many customers who said they would come back next week, clearly revealed in their body language that they would not. A specific way I train salespersons to use their growing knowledge of body language is to look at their customers looking at the home. The salesperson has been there before. It is not necessary for the salesperson to look up at the light fixture inside the front door to explain it to customers. It is much more useful to look at the customers as they look up when the salesperson delivers the cue. Their facial expression at that instant will reveal whether or not they like the light fixture. This extremely useful body of knowledge sometimes has an unfortunate aura of 1970’s California wine and sweet-smelling smoke attached to it. It’s not fair, because every sports coach in the world now teaches positive visualization as a method of increasing skill and confidence in athletes. Visualization is a classic NLP technique that has great value to new home salespersons. Sitting in their car for a moment, before a sales presentation begins, and just visualizing how it is going to go - how the customers will love the home - how excited they will become - how easily they will sign the contract is a great way to make that dream come true. Contrast that with listening to a shock jock on the radio, on the way to the presentation and making cell phone calls and texting along the way. Who has the better chance of selling a home today?